I’m feeling an affinity towards Porsche at the moment – you will soon find out why but meanwhile, Im sitting in Al Ain sulking about missing the Porsche GT3 Challenge. It’s hard to find a weekend to meet family and friends commitments when so much is going on in Dubai. The good news is, I am keeping in touch with the action at the Autodrome and it looks like the Saudi Falcons and Skydive Dubai Falcons are rocking the Round 5 of the Porsche GT3 Cup Challenge Middle East. I would have loved to be there to see my recent favourite team, Al Nabooda racing in action – the drivers are so warm and genuinely nice guys and I would have loved to meet them again. 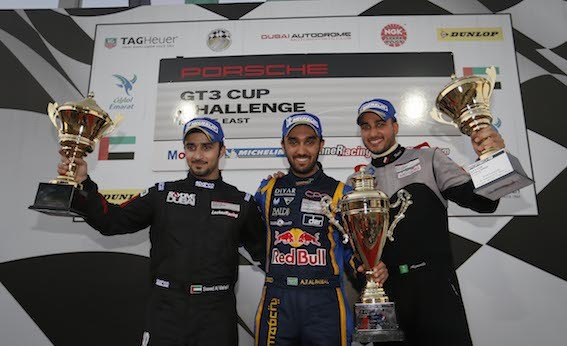 Anyway…Saudi Falcons Abdulaziz AlFaisal (1st) and Skydive Dubai Falcons Saeed Al Mehairi (2nd) stole the show to take the podium alongside Saudi driver Fahad Algosaibi (3rd) at the Dubai Autodrome in the opening racing of Round 5 in the Porsche GT3 Cup Challenge Middle East. In a memorable race in front of thousands of fans, AlFaisal recorded his first win of the fifth season, overtaking local favourite Al Mehairi with one lap to go in a gripping encounter that was filled with excitement on every lap. The result sees the gap at the top of the overall standings narrow to just 19 points as AlFaisal (177) moves into second place ahead of Zaid Ashkanani (174) who is 22 points behind Schmid (196), with 75 points on offer and three races of the season left . The podium was completed by talented youngster Fahad Algosaibi of Saudi Arabia who continued the form which saw him finish second in the last race at Losail International Circuit for Round 4. In the midfield tussle for the top 6 places Charlie Frijns, Zaid Ashkanani and Skydive Dubai Falcons Sheikh Hasher Al Maktoum go head to head with places constantly changing on each lap. In the end Frijns secured fourth, Ashkanani fifth and Al Maktoum sixth. The Al Nabooda Racing team’s Karim Al-Azhari who started ninth on the grid improved by two places to claim important points in his team’s quest to defend the Team title as Al Nabooda continue out front. While Qatari motoring legend Nasser Al Attiyah impressed again winning Silver category in tenth overall. 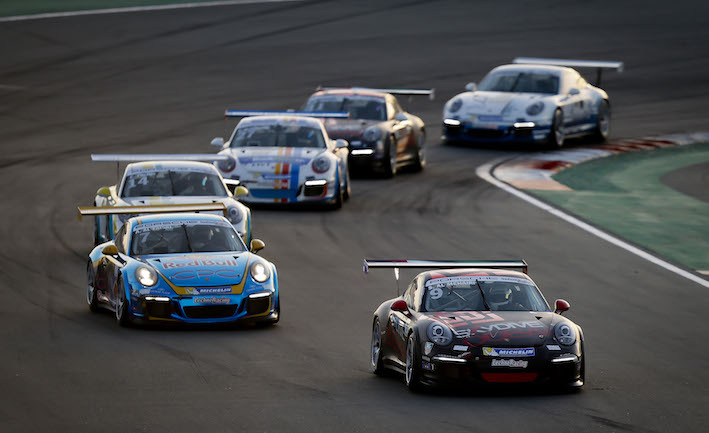 The region’s most professional racing series continues at the Dubai Autodrome with the second race of Round 5 tomorrow, Saturday 15th February at 15:55.